The Realtime Web is a hard thing to measure because it doesn’t exist only on traditional Web pages. It also exists in stream readers and desktop clients and mobile phones. And it is not just Twitter and Facebook . It is also bit.ly and TweetDeck and Seesmic and Tweeite and realtime search on Google and Bing, and the list goes on and on. So while we can look at comScore and see that Twitter.com in the U.S. was still flat in December, 2009 with 20 million unique visitors (up slightly from 19.4 million in November), that doesn’t account for the overall Twitter ecosystem or the larger Realtime Web beyond it. 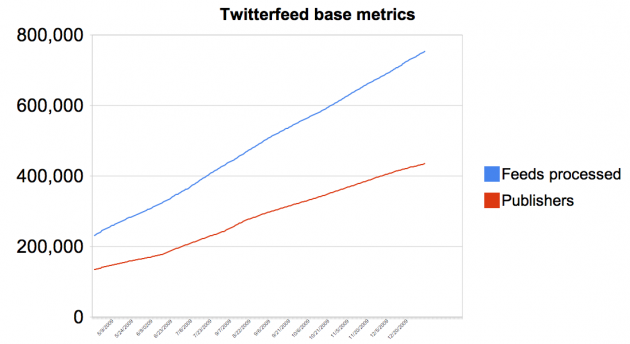 All we have is Twitter CEO Evan Williams’ word that usage hit an all-time high a week ago. There is no comprehensive data, only proxies like comScore. But in a post yesterday, betaworks (and bit.ly) CEO John Borthwick added some more data points to help paint a picture of the Realtime Web and how fast it is growing. Borthwick is one of the leading investors in the Realtime Web and he has access to a lot of data, including from bit.ly (the leading link shortener), TweetDeck (the largest Twitter client), and Twitterfeed (the main way to publish RSS feeds to Twitter). The data Borthwick presents is also directional and a proxy, but it is illuminating nonetheless. Let’s start with the Twitter data. He notes that about 50 percent of Twitter API calls are outside Twitter.com. This number represents data going back and forth, not people, and includes data from bots and machine clicks. In order to get a better estimate of the size of the overall reach of Twitter, Borthwick took Google Trends data for Twitter and “key clients” and “scaled that chart” over what appears to be comScore data for Twitter.com. The result is the chart above (click for a larger view), which shows the Twitter ecosystem reaching about 60 million people, with 20 million coming from Twitter.com and 40 million coming from elsewhere. By this analysis, the ecosystem is twice as large as Twitter.com itself. And it is growing, as opposed to the flat trend Twitter.com by itself is showing in the U.S. Again, as Borthwick points out, this data is nothing more than a proxy. However, he does offer some data which is more precise. For example, the rate at which bit.ly links are being clicked on is growing at a steep ramp, with more than 500 million clicks (or bit.ly “decodes”) per week. He writes that “last week was the largest week ever for clicks on bit.ly links. 564m were clicked on in total. On the Jan 6th there were a record of 98m decodes.” On January 8, 2009, TweetDeck surpassed 4 million updates in a single day. And Twitterfeed now supports more than 800,000 feeds from more than 400,000 publishers (see chart above). Finally, he pulls together a lot of different data points into a single chart to show the relative growth of the Realtime Web compared to the established Web as represented by Google and Amazon (the dotted lines in the chart below). In addition to the Twitter ecosystem (red dotted line), he also plotted Facebook (blue) and Meebo (green), both of which are growing even faster. Then he overlaid the bit.ly data on top of it all, which is based on a different scale. It’s a messy chart, but the one takeaway is that the Realtime Web is represented by the various colored lines and is growing at a healthy clip.